Last night at ANC6B’s Transportation Committee, commissioners from ANC6B and representatives from Barracks Row MainStreet and Capitol Riverfront BID submitted non-automotive transportation projects they hope to have funded by the $1.4 million available under the Neighborhood Performance Parking Fund. The committee will decide which projects should be prioritized and forwarded to the full ANC for approval at the March meeting next Tuesday; after that the projects are submitted to DDOT for review. The Neighborhood Performance Parking Fund comes from a portion of the increased parking fees in the three areas of the city where the Performance Parking Program has been implemented: Ballpark Area (including Barracks Row and Eastern Market), Columbia Heights, and H Street, NE. Within these areas, the following entities are eligible to apply for funding for projects: ANCs, Business Improvement Districts (BIDs), and Main Street organizations. DDOT gives the highest priority to projects according to location, key walking streets, pedestrian high-injury corridor, missing sidewalks, bicycle network, Capitol Bikeshare, and surface transit routes. Last Wednesday, the Eastern Market Metro Plaza Task Force met at Hill Center to consider the redesign of the Plaza. Design team leader Architect Amy Weinstein updated the Task Force on interactions with city agencies regarding the plans. The Task Force made a series of recommendations based largely on community feedback regarding design elements the Task Force would like to see incorporated into the design. The design team hopes to produce a draft redesign plan by June. That plan will be submitted to the community for comment and a final plan will be completed later in the summer. Weinstein stressed that the involvement of city agencies and securing funding will be necessary to move the plan forward. 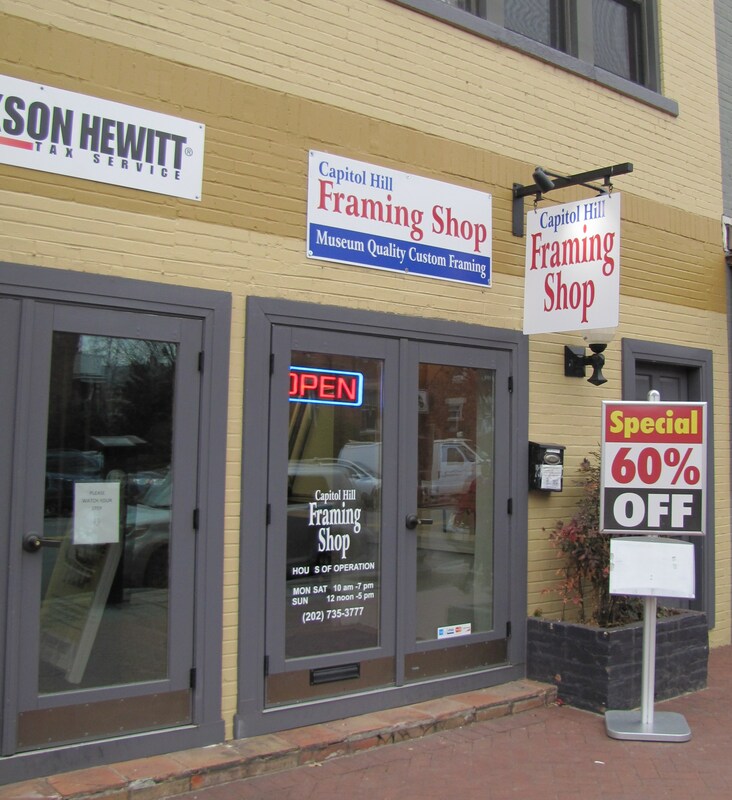 Capitol Hill Frame Shop Now Open on Barracks Row – A new concept frame store, Capitol Hill Frame Shop, is now open at 725 8th Street, in the space formerly occupied by Capitol Hill Fitness. The shop will feature custom framing while you wait, and while most frame stores typically feature regular discount sale periods, Capitol Hill Frame Shop will open with a 60% off sale and continue discounting as part of the business model. 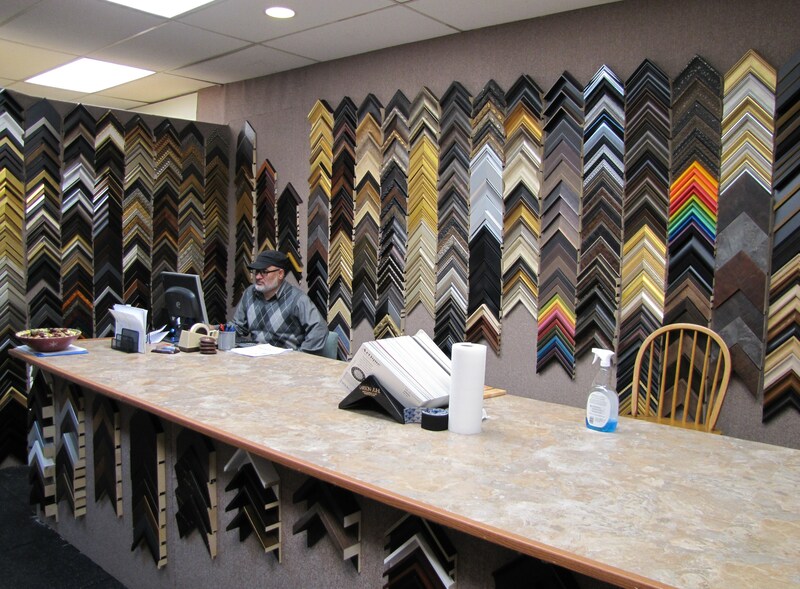 The shop is the third for owner Narem Jan, who owns The Frame Shop on Wisconsin Avenue, and Art Plus Frame in Fairfax. Hours are 10am – 7pm, Monday through Saturday, and 12:00 noon- 5pm on Sunday. 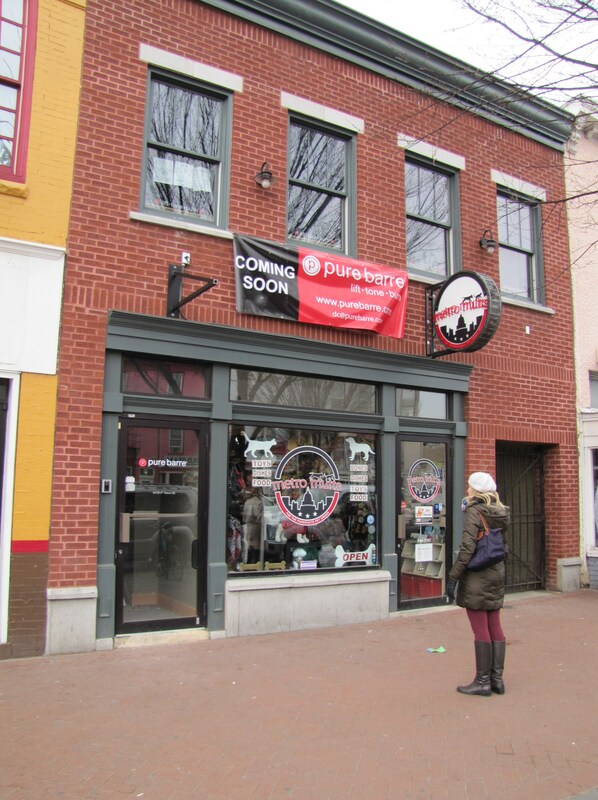 National Exercise Chain – Pure Barre – to Open on Barracks Row – Pure Barre will open an exercise venue at 407 8th Street, SE, in the space above the pet store, Metro Mutts. The chain has outlets in all 50 states. Pure Barre offers total body workouts utilizing the ballet barre to perform small isometric movements set to music. Southeast Library Now Scheduled to Reopen March 10 – The Library has been closed for almost two months to allow the repair of a water main. Donations of books to the Friends of Southeast Library has been suspended during this period. Meanwhile, the Friends of the Northeast Library is happy receive donations of high quality used books for their periodic book sales to raise funds for the librarian activities and equipment. Books can be brought to the library seven days a week. Mormon Church Gets Back on Track – Construction is again underway at the site of the new Church of Latter Day Saints in the 500 block of 7th Street, SE. Rumors were circulating last year that a dispute with the contractor had required the church to resubmit the job for bids. Peruvian Beef Heart, Chicken, and Ceviche Coming to H Street – A new restaurant featuring Peruvian chicken and ceviche will open at 1324 H Street, NE, in April. Restaurant Ocopa is the result of a partnership between chef Carlos Delgado and Chicken Tortilla owners Eddie and Italo Rodriguez. The Peruvian chicken is traditional as is the ceviche, with the latter showing the influence brought by Peru’s large Japanese immigrant population. Also on the menu: traditional potato/meat casserole, and grilled meat skewers, including what is almost a national Peruvian dish, beef heart. 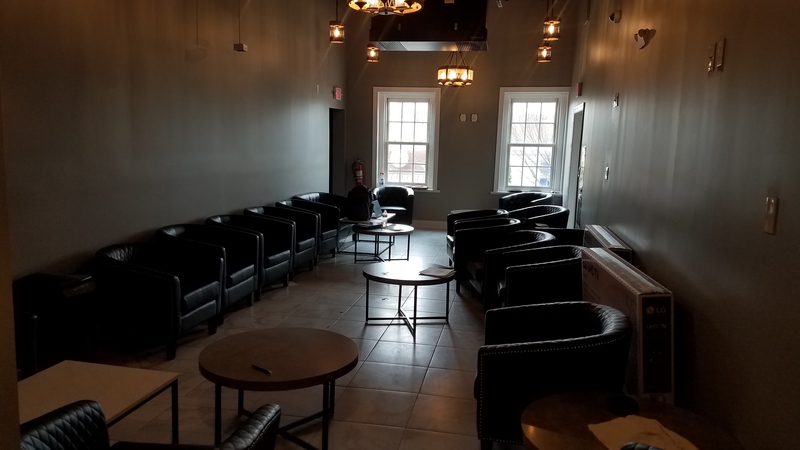 Chophouse To Open in Atlas District – The curiously named chophouse, Mythology & Lore, will open later this year at 816 H Street, NE, until recently the home of Fever Bar & Lounge. 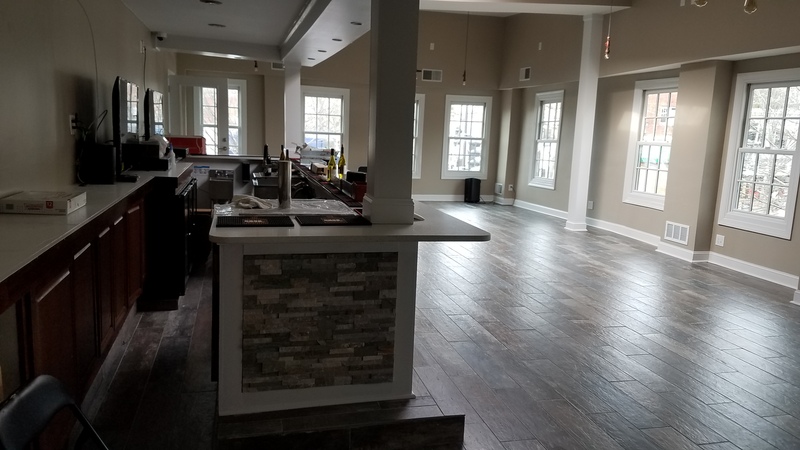 Owners Mark Medley and Todd Luongo will renovate the space over the next several months before opening to offer chophouse fare, quality wine, and craft beers. Last night, at the second of two community meetings called for this purpose, Amy Weinstein of Esocoff & Associates unveiled two concepts for the redesign of all of the public lands on Pennsylvania Avenue between 7th and 9th Streets, SE. The parcels include the Eastern Market Metro Plaza, the large triangular park between 8th and 9th Streets on the north side of Pennsylvania Avenue, the two smaller triangular island parks at the intersections of the two D Streets and 8th Street, and the median strips. Both concepts are comprised of numerous individual components which are being submitted to the community for input. Barracks Row Main Street’s David Perry, who hosted the meeting, characterized the plans as being in the early stages and far from definitive. Next Monday, December 16th, the plans will be posted to the project website – www.easternmarketmetropark.com – and comments can be submitted through the website until Friday, January 10th. The meetings this week and comments on the website provide an opportunity for the community to provide feedback and that information will be used to refine the plan until a final concept can be created (perhaps by next spring) upon which Requests for Proposals (RFPs) can be based. Last summer Councilmember Tommy Wells said that how quickly the RFP stage can be reached depends on how quickly money becomes available. He also said that how much the community decides to do will determine how much outside money will be needed. Both concepts for the Metro Plaza envision removing some trees currently growing on the plaza and replacing them with sycamore and/or elm trees. Both concepts call for a water feature, a re-located bus stop, chess tables, space for impromptu busking (street performance), an adult play lawn (reading, sunning, socializing), and a much reduced info hub – the long-desired brain child of the area’s retail interests. Elm trees would play a major role in the design, especially in framing the façade of the library. Long benches, designed to discourage sleeping, would line green areas and the water features in both concepts. The first concept for the Metro Plaza envisions a large “tree bosque” – or grove – with the sycamores arranged in a grid pattern. A broad “parade” – or sidewalk – runs from the Metro entrance to 8th Street, parallel to Pennsylvania Avenue. 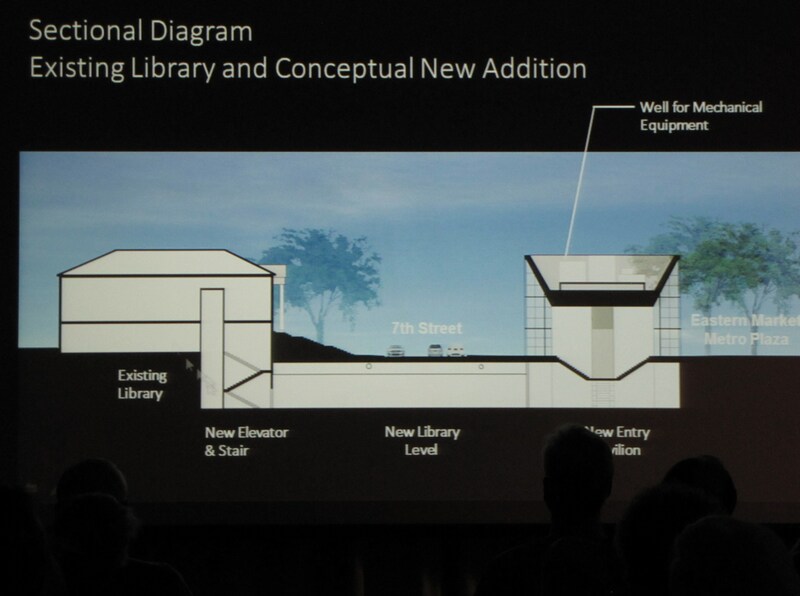 The façade of the Southeast Library would be a prominent feature of the new design which would open up the western end of the plaza and broaden the steps of the library allowing access to the library’s gardesn. 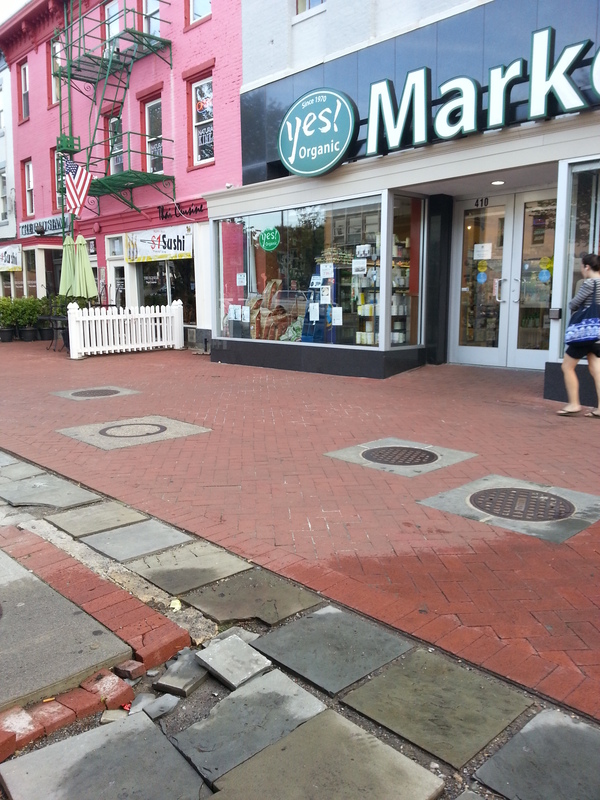 A fountain and still water feature would be located near 8th Street. The second concept for the plaza is considerably more ambitious and envisions actually incorporating the Southeast Library as a central component of the redesign by creating a below grade extension of the library on the western end of the plaza. The underground facility would be accessed by a small entry pavilion on the plaza itself and have skylights reminiscent of the U.S. Capitol’s Visitor Center or the National Gallery. Weinstein noted that space limitations made meaningful contiguous expansion of the Southeast Library impossible, and this proposal would increase the library’s current 8,000 square feet to the current community library standard of some 24,000 square feet. 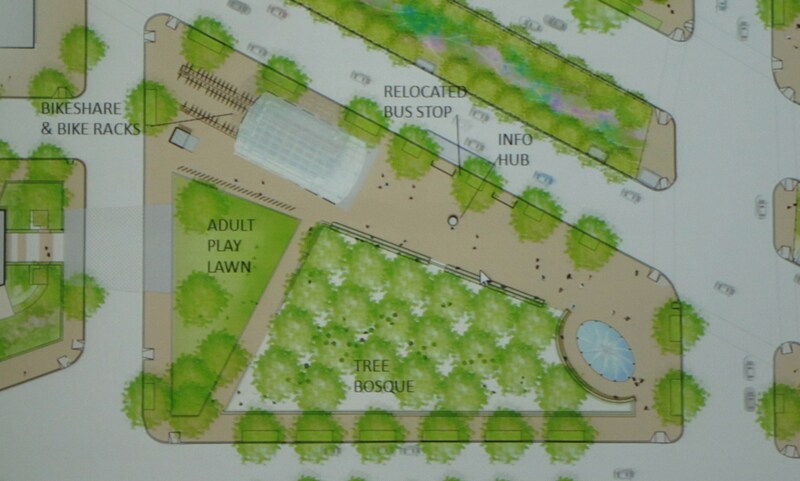 An intermittent water feature would be located closer to the Metro entrance. Regarding the park on the north side of Pennsylvania Avenue between 8th and 9th Streets, SE, the design team looked for inspiration to the existing “guerilla playground,” the Navy Yard and the Anacostia Watershed Society “Play and Learn” sites, and considered ways to incorporate berm landscaping and areas for adult play – sunning, reading, and socializing. Both concepts anticipate enclosing the children’s play area with an iron fence and both could accommodate water features which could be employed to support play devices which encourage cooperation among children and demonstrate simple mechanical principles. Two such items which were mentioned include a hollow “Archimedes’ Screw” to move water or sand, and a periscope. Both concepts include differing versions of a diagonal sidewalk from the 9th and South Carolina intersection to the 8th and Pennsylvania Avenue intersection. The first concept is based on the existing “guerilla playground” idea of moveable pieces which would be placed on a scaled-down Capitol Hill city streetscape, complete with an abstract model of the Capitol Building, behind which could be tiny community gardens. 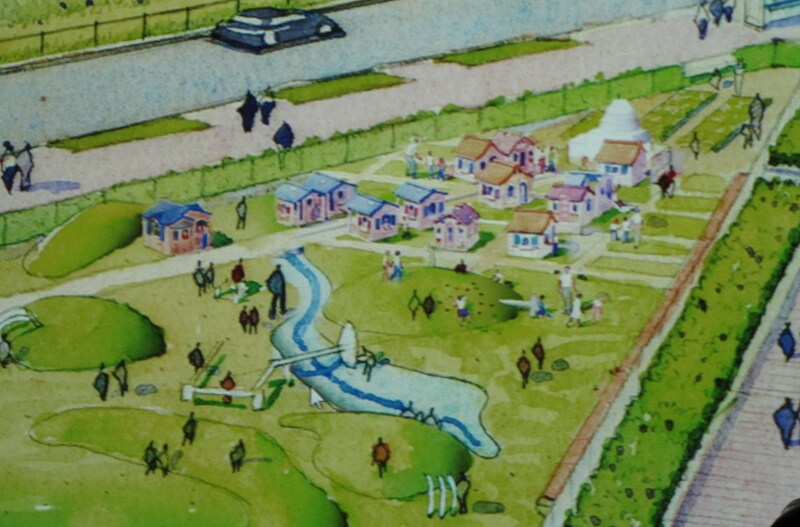 This model would provide the larger play area of the two proposals. A “landscaped panel” buffering the residential area could include berms and trees, but would not provide benches. The second concept provides a smaller play area which anticipates berms and interactive educational play tools, and an adult play area. For the medians, the plan is to beautify and encourage the use of intersections for pedestrian crossings. Landscape elements designed to remove silt and pollution from surface runoff water termed “bioswales” designed by Ohme vas Sweeden Landscape Architects would be the prominent feature, surrounded by iron fences or stone-capped brick retaining walls. 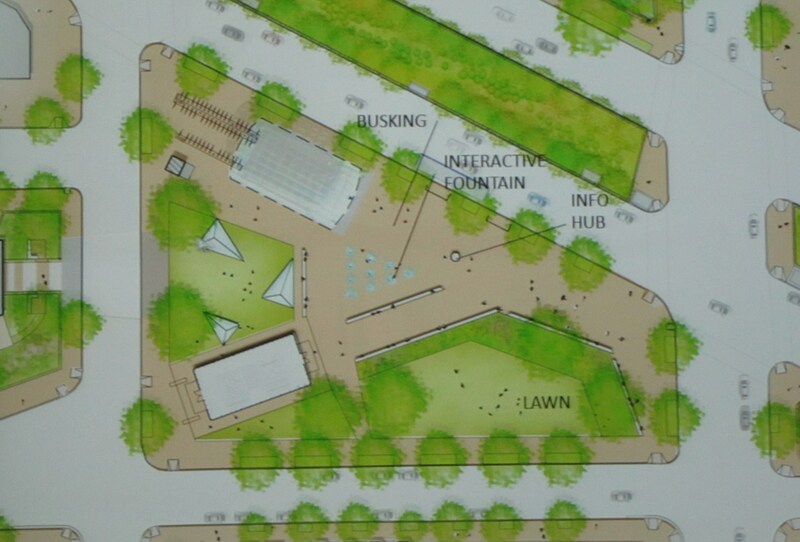 Similarly, there is only one design proposal for the two small triangular park portions of the redesign effort. 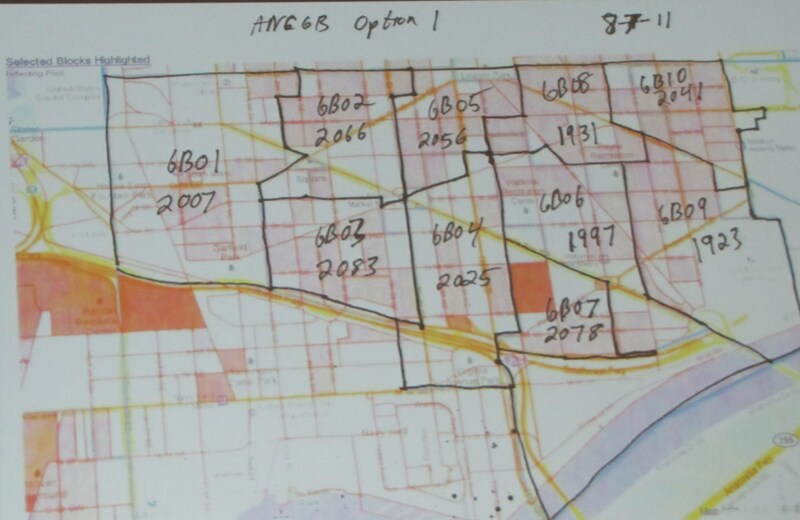 These are the parcels near Dunkin Donuts and at the southeast corner of the Hine site. Both are technically on the sections of the divided D Street which lie on both the north and south sides of the Metro Plaza. 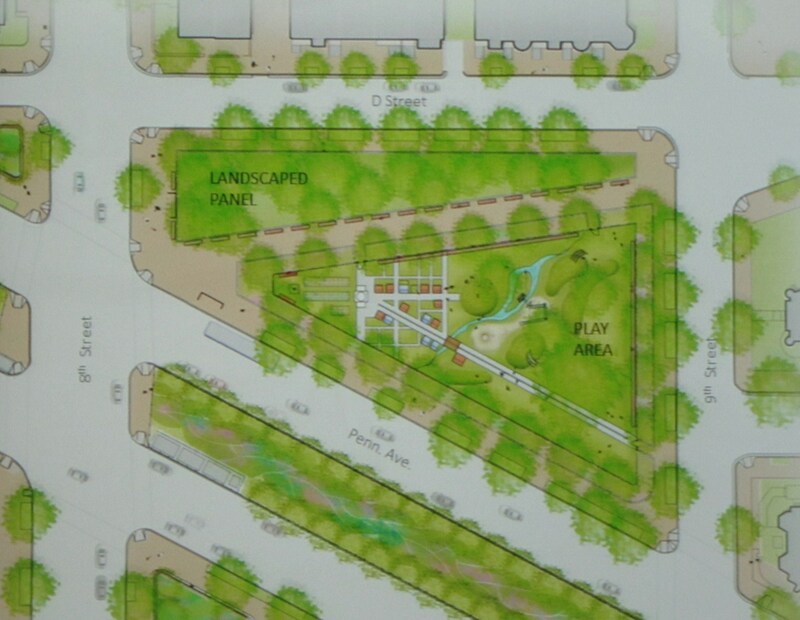 Bioswale would center both parcels and both would be surrounded by outward-facing benches. The redesign proposal includes elements to address the flow of traffic and pedestrian safety. Among the ideas being put forward include moving the Metro bus stop from in front of Starbucks to the east end of the Metro Plaza. The circulator bus stop would remain in front of Starbucks. Curb extensions or “bump outs” at corners (particularly at the problematic intersections of the two D Streets with 8th Street) would help protect pedestrians. Also suggested to this end was reversing the flow of traffic on the two short sections of the D Streets, making them one way in the opposite direction from what now exists. Other elements of the traffic proposal include moving the car share spots near Hill’s Kitchen to where the taxi stand is currently located near Southeast Library, closing the D Street spur in front of Community Connections, and moving the fire station bus stop to Pennsylvania Avenue in front of Community Connections. 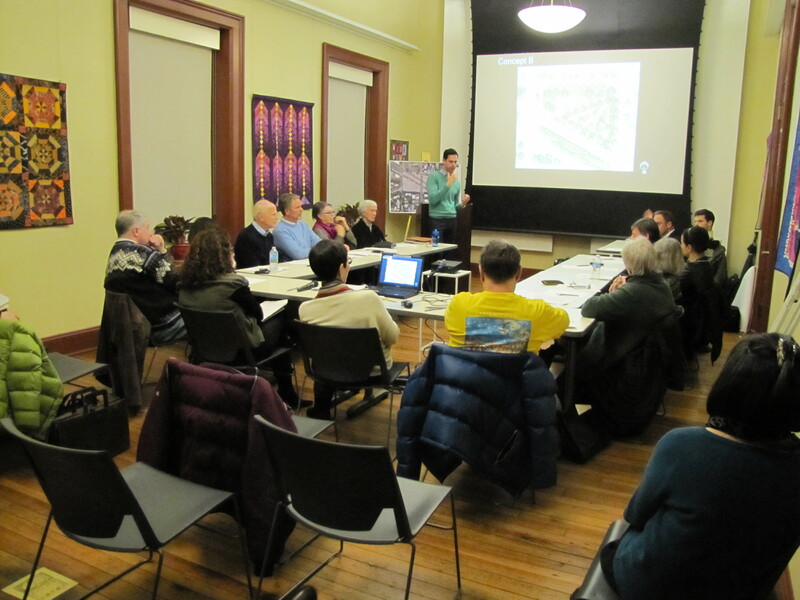 Last Wednesday, the “Taskforce on Eastern Market Metro Park” met at Hill Center to receive a presentation from the Market Plaza design team, led by Amy Weinstein of Escoff & Associates Architects. The discussion was guided by Barracks Row Main Street (BRMS) Board Vice-Chairman, David Perry. The convening authority of the Taskforce is BRMS, and the Taskforce is composed residents, groups, and businesses who Councilmember Tommy Wells referred to as the “front row stakeholders” to the redesign process. A complete list of the Taskforce membership is not yet available to the public. According to the design firm charged with the project, the goals of the redesign are to beautify it, and to increase its functionality as a connector between the 7th Street Eastern Market commercial corridor and the Barrack’s Row, 8th Street south of the freeway, and the M Street commercial corridor. 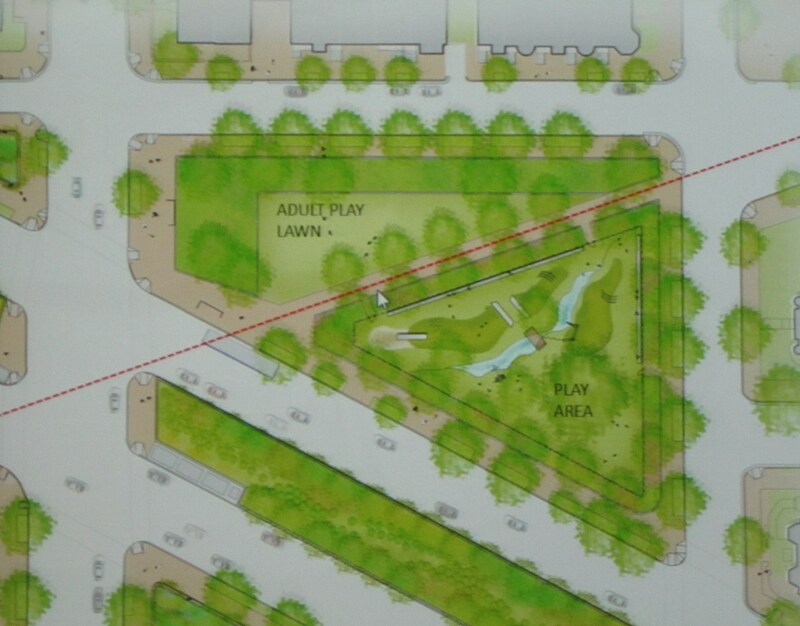 The firm also cites the goal of developing a portion of the parcel on the north side of Pennsylvania Avenue into a playground funded in part by a $50,000 grant from Stanton EastBanc (SEB) as part of the community benefits conceded by the developers as part of the Zoning Commission’s Planned Unit Development (PUD) process. Escoff & Associates was awarded the $500,000 contract for the study in April, via funds earmarked by the US Congress; by law, this money had to be expended by the end of September 2013. Another $1 million in earmarked funds remains to implement the design changes, though it is certain that additional monies will need to be sought from city or federal sources. By Wednesday night, the design team had compiled and grouped a list of community comments gathered from the Eastern Market Metro Park website, from community meetings, and from a suggestion box located in the North Hall of Eastern Market until August 7, 2013. The Taskforce advising the design team had only a few minutes to look over the compiled comments and a diagram of existing conditions. These materials are expected to be available on the Eastern Market Metro Park website at www.easternmarkemetropark.org during the coming week, as is a Taskforce roster. Weinstein asserted that the plans for the redesign already addressed several community concerns including environmental sustainability, pedestrian safety, and on-going maintenance of the park. The Design Team – specifically Amy Weinstein, Ohme vas Sweeden Landscape Architects, and Kittleson & Associates traffic and transportation consultants – will come back at the end of September to present two alternative concepts to the Taskforce for discussion. 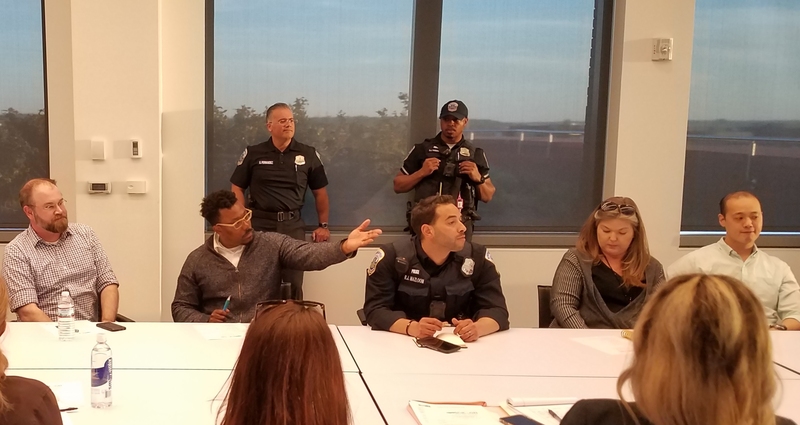 Input from the Task Force meeting will be incorporated into the two concepts which will subsequently be presented to a community-wide forum for community input. The Taskforce will then select the “final” design concept. Further consideration will then be given to details concerning the north parcel and the playground. One option that will not be considered is the possible rerouting of Pennsylvania Avenue. The issue was raised by a member of the Taskforce, but Perry noted that it was “off the table” having been rejected by the community when considered during a 2010 effort to redesign the Plaza. 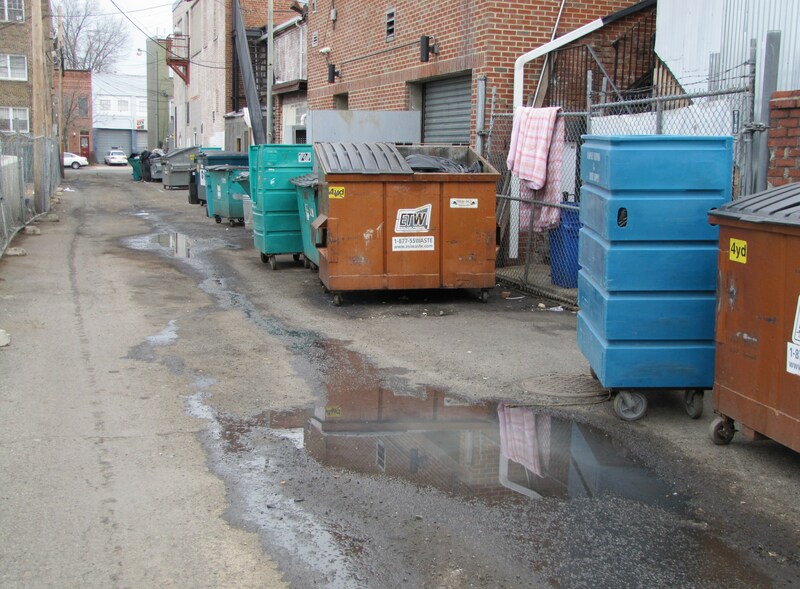 One Taskforce member expressed concerns about the “camp site” for the homeless that had developed on the north parcel between PA Avenue and D Street. In response, David Perry of BRMS, cited a study which he said shows that with an “increase in activity level, the problems we’re alluding to will disappear – some of the more problematic issues are inimical to large numbers of people.” It is clear that these issues will continue to be raised, but it is equally clear that no known member of the Taskforce has the competence or expertise to speak authoritatively about them. Tipton told the Board in a memorandum that the study will be funded with federal monies appropriated by Congress several years ago for BRMS to undertake a study of a redesign of the Eastern Market Metro Plaza and its associated parcels. Expiring authority for some of these funds require that they be spent this fall. The Tipton letter says that that, in addition to these expiring funds, “BMRS has over a million dollars from other congressionally appropriated funds.” Implicit in the remark is the earmarking of these funds for planning and development of this project. A previous 2007 – 2010 effort to develop a $30 million “Town Square Project” in the study area foundered, both for lack of funding and because of opposition from the residents who would have been negatively affected by the plan to change the existing right of way. The documents circulated by BRMS do not mention the issue of funding, but reference “minority” opposition from neighbors as the primary reason for the failure of that proposal. Under the terms of the proposed contract, Weinstein would develop a design concept leading to a “visual and functional improvement of the study area,” directed at establishing the long sought link between Barracks Row/Lower 8th Street retail and 7th Street retail including Eastern Market. In addition, she would develop a portion of the “north parcel” for a “tot lot” partly funded by Stanton Development. Stanton committed $50,000 to development of a playground in the park as part of the negotiated benefits and amenities for the community during the Hine Development PUD process. The accompanying public relations contract describes a tightly managed public input process designed to produce an outcome in support of the plan. In fact, if it develops that what is being proposed is a general beautification of the area, the extent and nature of any opposition seems doubtful. On the other hand, it seems clear that the study is being driven, in part, by the necessity to spend funds which will otherwise be lost. And given both the uncertainty regarding funding yet another project in an era of tight budgets and the lack of obvious city impetus for the plan, it seems likely that an additional motive for putting the proposal back in play is meant to take advantage of what backers hope will be the election of Councilmember Tommy Wells as mayor, and anticipation of his support. The study will take 7 – 9 months and could begin as early as May 1, 2013. The Ward Six Taskforce on Redistricting, appointed by Councilmember Tommy Wells, and chaired by former ANC6A Chair, Joe Fengler, voted against annexing Near Southeast south of the freeway to ANC6B, thus increasing the number of commissioners from 10 to 12 and the ANC district from 20,000 to 24,000 residents. Instead, they opted for a “status quo” plan which makes minimal changes to ANC6B. 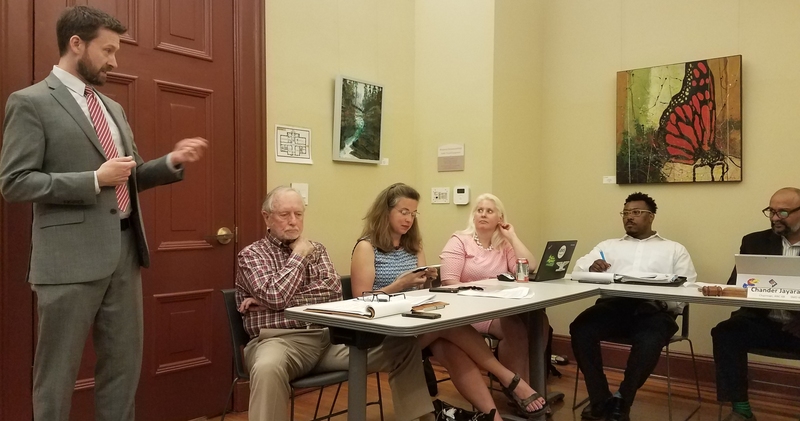 The vote was 4 – 3 in favor of the status quo plan, with Taskforce members Fengler, Marge Francese, Antoinette Russell, and Skip Coburn voting for the status quo. Ken Jarboe (Councilmember Tommy Wells’ political organizer for Ward Six), Donna Scheeder, and Tyler Merkeley voted for the expansion. Taskforce Members Cody Rice, Raphael Marshall and Gene Fisher were absent. There seemed to be considerable support among the ANC6B Commissioners to incorporate Near Southeast into ANC6B, even though it would put Commissioners Frishberg and Metzger in the same single member district and pit them against each other in the next election. The Taskforce was evenly divided on the question, and Fengler’s vote proved decisive. Fengler stated his reasons for supporting the status quo option. He cited former Councilmember Sharon Ambrose’s advice against creating a “ward within a ward.” He stated his own belief, as a former ANC chair, that ANC’s should be about the same size. He noted that the decisions of such a large ANC as proposed would “impact ANC’s 6D, 6A, and 6C.” Finally, he wondered how much an ANC6B, oriented toward Eastern Market and Barrack’s Row, would care about liquor licenses and zoning decisions in Near Southeast. Before the final vote, the Taskforce agreed to a motion by Ken Jarboe to post both proposals on the Taskforce website for comment. Jarboe’s motion was agreed to 7 – 0. Most of the changes to ANC6B single member districts were minor. One of the more notable adjustments divided control of the Eastern Market Metro Plaza among the single member districts of Commissioner Frishberg, Metzger, Oldenberg, and Pate. Previously, it had been totally within Frishberg’s single member district. In addition, the new plan split responsibility for Barrack’s Row between Commissioner Metzger and Oldenburg, both of whom previously supported a moratorium on Barracks Row liquor licenses. Until now, the west side of the 500 block of 8th Street where Chiptole’s Mexican Grill will open – which Frishberg supported – had been Frishberg’s responsibility. The preliminary plans agreed to tonight will go to their respective ANCs for consideration and input. Taskforce Members will attend the ANC meetings in September to answer questions. ANCs will have the opportunity to weigh in during the first two weeks of September. By September 18th, the plans will be made public. The Taskforce will have two meetings in September to hear recommendations and finalize the map, which will then go to Councilmember Wells on September 27th or 28th. ANC6b05 Commissioner Brian Pate was among the 41 protestors arrested for civil disobedience outside the Hart Senate Office Building on Monday, April 11. The protest was directed at the restrictions imposed by the federal government on the city’s ability to spend its locally raised funds. Specifically, the city’s rights were bargained away in a last minute deal between the administration and the congress to avoid a government shutdown over lack of agreement on a budget. Pate was asked by emmcablog to recount the experience. At first I thought ‘They’re not going to arrest us.’ Then they stared coming out and giving warning to the protestors. When they started to break out the flexicuffs, there were a good 100 people in the street. As soon as they started giving warnings, people started peeling off. I decided to stay. And other people saw it was going to happen and they decided to stay. They were caught up in the spirit of the moment. I didn’t go there to get arrested. I knew it was possible – as soon as the first person was arrested, I knew I had to stay. To do anything else would be a failure of leadership. Those who claim the mayor and others were grandstanding miss the point. They started arresting people one by one. They started from the back. I was the third person arrested. I was tagged as number 8. Tommy Wells was 41. They put us in a paddy wagon. I shared one with the Mayor Gray, Kwame Brown and Michael Brown. I had a chance to observe the Mayor and talk to him about what he was thinking. I asked him, ‘When did you know you were all in?’ It was clear to me that it was somewhat spontaneous. He security detail didn’t know and didn’t know what to do. They took us to a facility on Half Street by the DMV. They had flexicuffed us and separated the women from the men in paddy wagons. Extra males were put on a bus. They were civil to us. They lined us up against a wall and took our info and inventoried our belongings. They uncuffed us and sat us on folding chairs in a warehouse area. All 41 of us were in a room. They gave us a short explanation of what would happen. We could pay a $50 fine or take a court case. The majority decided to pay. That speaks to the spontaneity. There was no consensus on whether to pay or go to court. There was no time to strategize. I asked the Mayor whether he was going to pay or go to court. He paid, and I followed his lead. Then the first ten were recuffed and bused to a holding facility by the Monocle (US Capitol Police Headquarters). They put us in cells, four people to a cell. They let the Mayor sit in a chair by a desk. That was the only time I saw him receive different treatment. The scanned our prints facial features one at a time. That took from 11:30 (pm) until 1:45 (am). Ed. : What was going through your mind when you were deciding to be arrested or not? Pate: I was asking myself, ‘Is this the right moment to make a stand or take part in a stand?’ I felt that it was. That’s the decision I made. The worst part is I didn’t have time to call my wife. I have two little children. They refused to give us a phone call. My wife was really worried. That’s the only thing I regret – making her worry. My observation is that this was a diverse group – 27 men and 14 women. Politicians from mayor to ANC commissioners. Regular citizens. About evenly split between black and white. People with walkers – canes. Older people to those barely out of college. Impressive. People from every or, nearly every, ward coming together in the solidarity of the moment. Ultimately, I thought of the morality of issue and the moment, and I think I made the right choice and I hope more people will get involved with DC Vote. I hope more people protest in a variety of ways. This was successful if you look at the chatter on the blogs – this issue got more attention in the last two days that in the last two years. .
Last night at ANC6b’s regular monthly meeting the commission voted to send a letter of support to DDOT supporting the construction of the new Info Hub. The concept is the brain child of Chuck Burger and the so-called “Sign Tigers,” a group representing BRMS and CHAMPS who distribute information to visitors to the Eastern Market Metro Plaza most weekends. The all weather Info Hub would replace the tent under which personnel have been operating. An image of the structure is available elsewhere on this blog (click the “Metro Plaza” tag). Burger told a group of residents on Monday night that the project could be completed by this coming October. There was some discussion at last night’s meeting regarding language proposed by Commissioner Ivan Frishberg, supporting upgraded landscaping for the plaza to take place in conjunction with the Info Hub project. The landscaping language met opposition from Commissioners Garrison, Oldenburg, and Metzger who urged that the community be consulted before any landscaping changes are made. Underlying this discussion was the now-dormant and misnomered “Town Square” plan to create a new traffic pattern through and around Metro Plaza. The issue is controversial in the community. 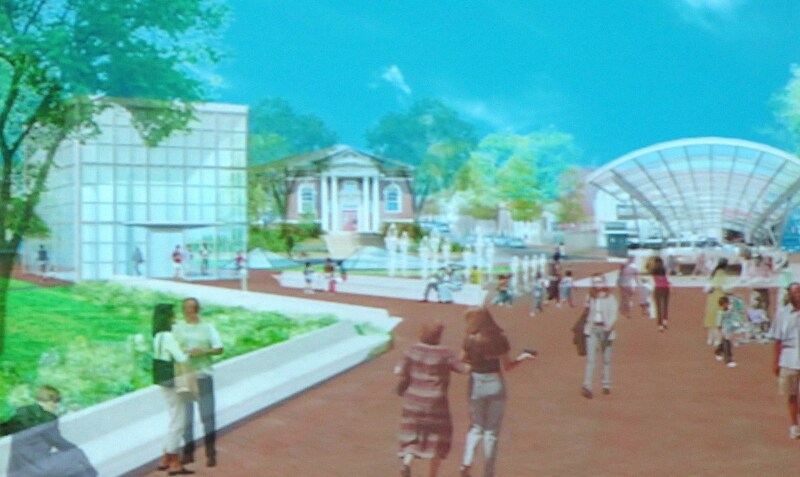 Supporters and opponents seem to take the view that any change in the current Plaza has implications for the resurrection of the plan which has been pushed by Barracks Row Main Street and Capitol Hill Restoration Society, among others. The Commission eventually voted for the language by a five to three vote. Those voting for: Glick, Frishberg, Green, Pate, Critchfield. The text of the letter is below. Advisory Neighborhood Commission 6B at a properly noticed, regular monthly meeting on Tuesday, April 12, 2011, voted X –Y to support the proposed Community Information Hub to be constructed on the Eastern Market Metro Plaza. The Commission authorized this letter to the DC Department of Transportation to express ANC 6B’s support for allocating $180,000 for project from the Performance Parking Pilot fund and for the proposed management of the operations of the facility by the Capitol Hill BID. 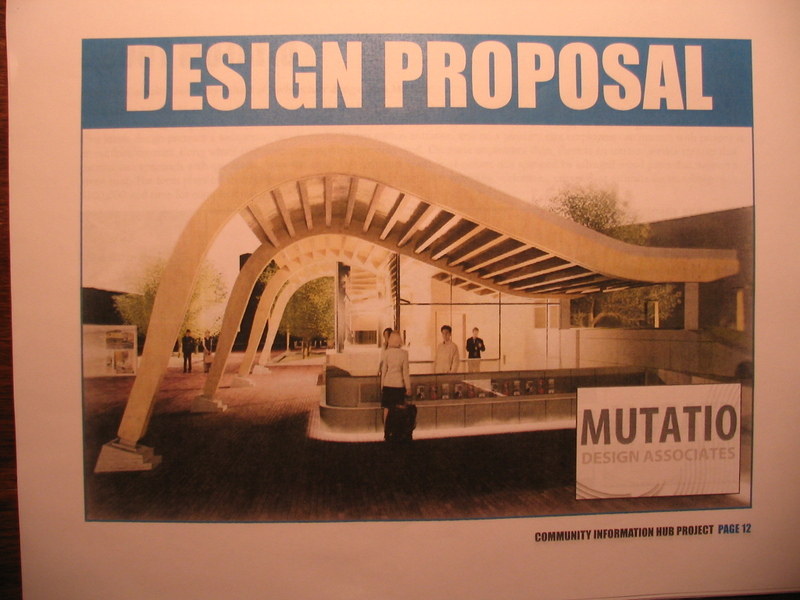 The Commission also wishes to express its support for the proposed “Mutatio” design for the information center. In addition to support for this project, ANC 6B also asks DDOT to give serious consideration to much needed upgrading of the landscaping on the Eastern Market Metro. Timing such improvements so that they are done when the new information center is completed would enhance the success of the new facility. 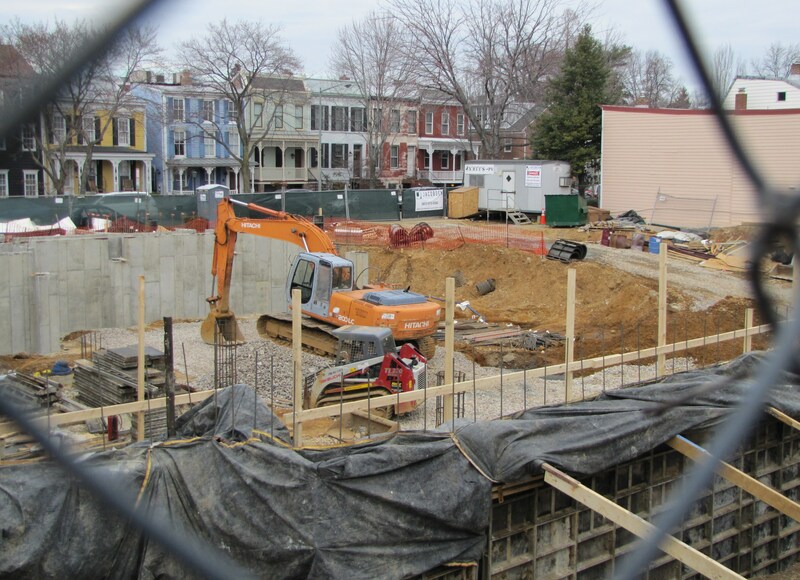 Thank you for DDOT’s encouragement of this important project for the Capitol Hill community. Councilmember Tommy Wells will discuss the process regarding new legislation to establish a new governing authority for Eastern Market. “Sign Tiger” spokesman Chuck Burger regarding the new Information Hub planned for the Eastern Market Metro Plaza. A presentation from Councilmember Tommy Wells regarding the process for establishing a new governing authority for Eastern Market. The report of the Taskforce that Wells appointed to make recommendations regarding a new authority may be posted on Wells’ website as early as Wednesday, April 13. At Tuesday night’s Capitol Hill Restoration Society Board Meeting, Board member Chuck Burger, representing the ad hoc group of “Sign Tigers” promoting the construction of an information kiosk on the Plaza to promote food and retail services and the historic district, announced that DDOT had recommended a design for the project. The winning design, the Mutatio Design Proposal, was selected from a total of 28 designs created by students at the Catholic University School of Architecture. Matt Himler, who along with four other architectural students (EJ Crough, Yomar Soliz, Laura Cisneros, and Jackie Alvarado) created the design, described the wooden structure with a gently curved forty foot canopy, reflective of the Metro canopy. A large outdoor counter will allow interaction with visitors during fair weather, while an enclosed 300 to 350 square foot space would serve for winter and inclement weather. The design anticipates space for display and distribution of literature and pamphlets. Burger noted that one of the criteria for the project was that it could be dissembled, should the plan of the Plaza change in the future. He noted that construction of the kiosk would point up the drabness of the rest of the Plaza, implying perhaps, that it would be a catalyst for change. The kiosk will be staffed by volunteers. Its annual operating budget of up to $15,000 will come from a foundation which has been set up by CHAMPS – the Capitol Hill Chamber of Commerce. The project will be funded by DDOT from funds provided by the Impact Parking Program – the fees exacted by the new meters resulting from the impact on parking of Nationals Park. Burger will meet with ANC6b next month and will meet with community groups to get maximum community input before the next phase, the construction phase. The CHRS Board unanimously endorsed the concept and the design and stated they looked forward to a final review of the design that addressed questions regarding community impact.